Zoo Printing produced sample kits that contain printed samples with contemporary designs and product suggestions for you to use as a selling tool. Each piece has been printed on the exact stock with the exact ink and coating options we offer on that stock. It's the best way to show the print quality, thickness, texture and feel of every substrate we offer. Sample kits are unbranded and have no reference to Zoo Printing. The offset sample book contains all 11 stocks offered and their corresponding coating options. These books ship in generic envelopes. One free offset sample book is available for new Zoo clients. Additional sample books can be purchased. If you have already ordered your free sample book, you can order individual books by clicking option A on the right side of this page, inputting your desired quantity and clicking "Continue." 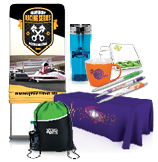 The large format sample kit contains 27 different substrates to showcase our full large format product line and comes in its own, unbranded box. To order a large format sample kit, click option B on the right side of this page, input your desired quantity and click "Continue." To order complete sample kits, click option C on the right side of this page, input your desired quantity and click "Continue." Sample stocks for 1&2 Color products are available in many local retail stores. If you would like to request a free sample booklet, you must first have an account and be logged in. If you would like to register for a new account, Click Here.